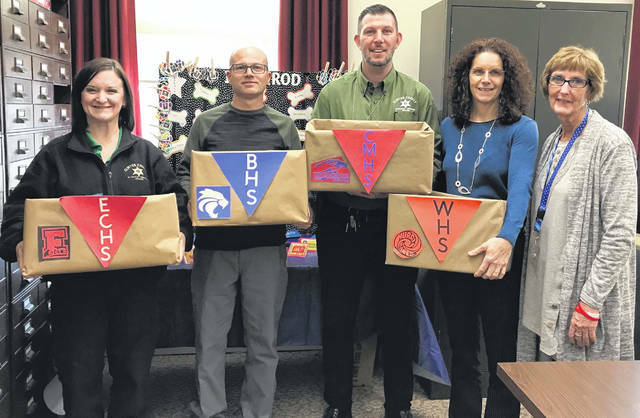 From left are staff with the Clinton County Juvenile Probation Department: Rachel Young, Chad Mason, Adam Green, Deanne Whalen and Margie Eads. WILMINGTON — In what is becoming an annual tradition, county employees held a combination charity/contest based on the 46th Iditarod Trail Sled Dog Race across Alaska. All of Clinton County Juvenile Court Judge Chad Carey’s staff along with some other county employees took part and were able to draw a couple of mushers to cheer them on. Twenty-three participants from the county courthouse participated in the Iditarod this year. Items collected are going to the Clinton County Juvenile Probation Department. Collected were gift cards, book bags and many other items for juveniles. Altogether, more than 90 items were collected along with $160 in gift cards. These will go to students from Blanchester, Clinton-Massie, East Clinton and Wilmington school districts. Along the trail individuals had a little fun as well. Every morning the board of mushers were moved to see who was winning and who was in last place. Several awards were passed out along the trail — from the musher who hit a tree and had to have stitches to ones who just needed to be cheered on. Clinton County Probate Court staffer Sue Barr’s musher crossed the finish line first, finishing in nine days and 12 hours. Barr’s office colleague Joy McGowan’s musher placed second. This year’s Red Lantern award — which goes to the last-place finisher who nonetheless displays perseverance — goes to area attorney Tony Baker whose musher finished in 14 days and 52 minutes. Fiscal Officer Georgia Carr passed the lantern on to Baker who will display it for the next year for all to see. First-place champion Sue Barr won a new Matchbox truck for enjoyment. “It is a fun way to help others in our community and a privilege, and we are already looking forward to next year,” a courthouse spokesperson said. https://www.wnewsj.com/wp-content/uploads/sites/22/2019/04/web1_iditarod.jpgFrom left are staff with the Clinton County Juvenile Probation Department: Rachel Young, Chad Mason, Adam Green, Deanne Whalen and Margie Eads.